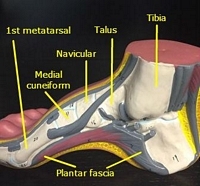 The plantar fascia is located on the bottom of the foot, running from the heel toward the toes. It helps support body weight. Plantar fasciitis is a repetitive stress injury that occurs after standing, running or jumping increases the strain on the fascia and causes injury. The symptoms of plantar fasciitis are generally swelling on the bottom of the foot and tenderness on the inside of the heel. Those experiencing plantar fasciitis feel a sharp, stabbing pain on the bottom of the foot that decreases after a few minutes, but may return after standing or sitting for long periods of time. The pain can disappear during activity, but return afterwards. Because plantar fasciitis is aggravated by standing and walking, it can often affect people for three to nine months. Many jobs require hours of standing, and anyone who is relatively active can experience a slow recovery because of everyday walking and standing. Those in professions that require continuous standing can have a tendency toward long-term problems. Home treatments for plantar fasciitis include rest and ice. By decreasing the activity and pounding forces to the soft tissue muscles, tendons, and ligaments, the tissue is given a chance to heal and recover. Many people think plantar fasciitis should heal within a few days. However they often wait too long before seeking treatment or reducing their activity, which results in severe damage to the plantar fasciitis that requires weeks to heal. Changing footwear is very beneficial to anybody expensing foot pain. Wearing more supportive shoes that absorb the forces while walking, standing, and running remove those forces from the plantar fascia, which means the tissue is not exposed to as much trauma and has a better chance to heal and recover. Some patients benefit from orthotics or foot inserts. Often times compression with ice is very beneficial. Some people will fill a water bottle with water and then place it in the freezer. They then take the small water bottle and roll it underneath their foot providing pressure as comfortably tolerable. Many patients benefit from utilizing a golf ball in a similar manner, where slowly rolling their foot cross the golf ball helps break up some of the scar tissue and irritation. The compression also helps relieve some of the pain. Your healthcare provider will perform a thorough evalution during diagnosis of plantar fasciitis. The physician wants to rule out other types of muscle, tendon, ligament, nerve entrapment, or stress fractures that can produce foot pain with activity. X-rays or MRIs may be utilized for further evaluation if the provider feels it is necessary. Oftentimes a trained healthcare physician feels confident in the diagnosis without advanced imaging to evaluate the bones, muscles, tendons, and ligaments. The location of pain and the factors that make it better and worse are often the most distinguishing characteristics of plantar fasciitis. Cortisone injections may be utilized to decrease the pain in inflammation. Other times the foot and ankle specialist may recommend over-the-counter anti-inflammatories, prescription medications, or pain relievers for your condition. Physical medicine treatments are performed to decrease pain and inflammation in the soft tissue of the foot. Ice, heat, electric, and ultrasound are very common treatment modalities. Once the pain and inflammation decreases to appropriate levels, stretching and strengthening activities may be performed. Stretching the gastrocnemius and soleus muscles are important in helping the lower leg. Other muscles can contribute to developing plantar fasciitis including tibialis anterior, quadriceps, and hamstring muscle tightness, which limits flexibility and alters running and walking gates. Specific balance exercises can be given to increase foot strength and endurance. Often times patients have weakness in their ability to stand on one foot with their eyes closed while maintaining their balance. This lack of proprioceptive ability results in excessive strain on the lower leg and foot during running. Properly strengthening these muscles helps relieve stress on the tissues and ultimately allows the fascia to heal. Exercises can be performed on the ground, unstable surface such as a BOSU ball, foam, or vibration plate. The more difficult and challenging the surface the more the body is challenged and will improve. Plantar fasciitis treatment often benefits from massage therapy or active release technique in the lower leg muscles. Muscle treatments are applied to dysfunction in muscles that are altering or limiting running gait, such as the quadriceps, hamstrings, gastrocnemius, soleus, tibialis anterior, fibularis longus, fibularis brevis, or posterior tibialis muscles. Massage therapy and active release technique are very effective treatments it addressing injuries in these muscles and accelerating their healing. Graston technique is one of most effective treatments at improving plantar fasciitis. It can be used on all of the lower leg muscles and the bottom of the foot, along the plantar fascia. Graston technique utilizes stainless steel instruments specifically designed to develop sheer force. When the tools slide along the skin they help pull one layer of tissue past another. The scar tissue that has developed from the micro tearing of the fascia is pulled apart, which triggers the body's healing mechanisms to come in and repair the fibers. Oftentimes scar tissue has developed along the plantar fascia from years of standing, walking, and running. Graston technique helps break up the scar tissue throughout the fascia. Class IV cold laser or low level laser therapy is an excellent treatment modality for decreasing pain and inflammation. Specific wavelengths and frequencies help shut off inflammatory cells. By stopping the production of these inflammatory markers there is less pain and inflammation around the tissue. Excessive inflammation slows down healing and makes the area more sensitive to the touch. Different wavelengths and frequencies help turn on the repair and healing processes inside cells. These wavelengths trigger the increased ATP or mitochondrial production of energy within the cells. The repairing cells then use this energy to lay down more fibers at a faster time frame. Laser is speeding up the healing and repair processes in addition to decreasing the inflammation. Not all lasers are equal. 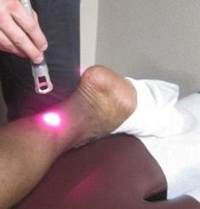 Older class III lasers do not provide enough benefit for plantar fasciitis. Class III lasers produce about 6 J of energy per minute that stimulates the outer aspect of the foot and fascia. Meanwhile the much stronger Class IV lasers produce 2000 J of energy that stimulates the cells on the surface and deeper within the foot. Class IV lasers have the ability to penetrate 6 - 8 cm, unlike class III lasers that could only penetrate 2 – 3 cm. Plantar fasciitis is a common condition in runners, jumpers, weekend athletes, and people who stand on their feet. Multiple treatments are often required to help with the pain and inflammation. Over-the-counter NSAIDs, icing, rest, and improved footwear provide a significant benefit for many people. Others require in office treatments to help with moderate or severe cases of plantar fasciitis. Cortisone injections, orthotics, foot inserts, massage therapy, Graston technique, active release technique, and cold laser are excellent treatments for anybody affected with moderate or severe plantar fasciitis.